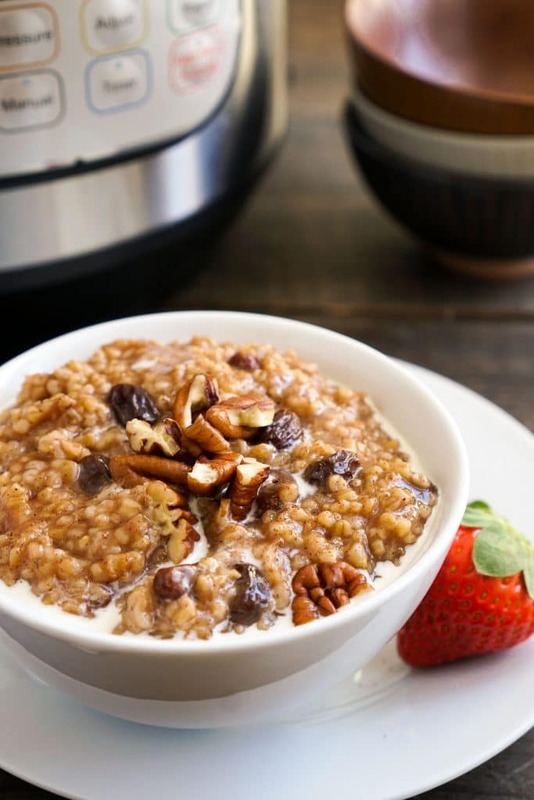 Making a hearty, healthy breakfast of Steel Cut Oats is faster and easier in the Instant Pot than making them on the stove! Although now that I have an Instant Pot, I wish I hadn’t waited so long. You name it. I embraced it as a reason to avoid buying one. And then I realized this past Christmas that I had a gift card that was in that awful phase of beginning to decline in balance each month and I thought — Hey. What’s worse? Spending some money you’re about to lose on something you’re not sure you need or simply losing that money? So I bought an Instant Pot. And I haven’t regretted the purchase for a second. I did, however, opt for the little one — the 3 quart Instant Pot (This is an Amazon affiliate link to one similar to mine). I realized that thing I like least about my slow cooker and my pressure is that they’re both SO BIG. They take up a ton of room and the cleaning of the inserts is a hassle. Neither will even fit comfortably in my sink. The 3-quart Instant Pot insert is like a small mixing bowl. Problem solved. The next problem I had to get comfortable with, though, had to do with the Instant Pot’s dual slow cooker and pressure cooker status. I was trying to determine why an Instant Pot is a better idea than having both a slow cooker and pressure cooker. As it turns out, it is BUT it’s sort of hard to explain why. Since purchasing my Instant Pot, I’ve found myself regularly prepping dinner at 4 pm even though we don’t eat as a family until 6:30 pm. In the past, trying to prep dinner at four meant the meal was ready too early and no longer at its best by dinnertime, and yet, it was too late to allow for a slow cooker recipe. Sure, there are plenty of other recipes that I make for my family that will work on this time 4pm-prep time frame (like my family favorite Quick and Easy Gluten Free Lasagna), but for recipes like the Instant Pot Beef Stew I’ll hopefully be sharing here later this week, the Instant Pot works perfectly. It also works perfectly for cutting the time needed to cook whole grains, like these Instant Pot Steel Cut Oats. And because the Instant Pot is self-contained, you simply stir, set it and forget it. No more tending to the pot and stirring oats on the stove. Add steel cut oats, raisins, brown sugar and cinnamon to Instant Pot; stir to combine. Add water and stir. Once finished cooking, allow pressure to release naturally (about 5 to 10 minutes). After pressure releases, open lid and stir. Top with pecans and milk, if desired.